Jack Vance was a successful mystery, fantasy and science fiction author who wrote more than a dozen books and also wrote TV screenplays. He and his wife Norma spent several months in Mexico traveling with Frank Herbert (author of Dune) and his wife Beverly and their two young sons in the second half of 1953. Vance had met the then less successful Herbert a year earlier in California, and the two had become friends and writing companions, sometimes working on joint projects. They decided to visit Mexico in search of new experiences and stimulation. The Vance-Herbert friendship was the start of one of the greatest literary bromances related to Lake Chapala. Many aspects of the families’ joint trip to Mexico in the Vances’ new blue Jeep station wagon are endearingly told by Herbert’s elder son, Brian, in Dreamer of Dune: The Biography of Frank Herbert. Vance and his wife Norma bought a new blue Jeep station wagon for the trip and the families shared driving, expenses and domestic tasks. After stopping briefly at a roadside monument marking the Tropic of Cancer, Norma accidentally left her purse on the car as they drove away. By the time they made a quick U-turn to recover the purse, which contained Jack’s favorite fountain pen (Vance was accustomed to writing long-hand whereas Herbert used a typewriter), it had been run over by another vehicle and the pen squashed. The “two-story adobe and white stucco house, which had been converted to a duplex” rental property was on the hillside a block from the lake. Strict silence was enforced during the mid-morning to mid-afternoon “writing hours”, so that both men could concentrate on developing plots and characters. While the writers did cooperate on some “joint ventures” while in Chapala, they each also wrote short stories, hoping to sell some to magazines north of the border and thereby extend their stay in Mexico. 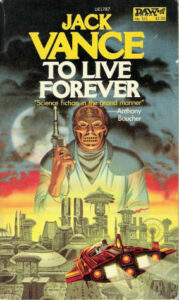 It should be noted that To Live Forever was Betty Ballantine’s choice for the title, not the author’s. Well received by critics, it was later renamed Clarges. After two months in Chapala, with funds running low, the Vances and Herberts decided to move to the larger, lower-cost city of Ciudad Guzmán in southern Jalisco. After about a month in Ciudad Guzmán, with funds running low, the group returned to the U.S. and then shared the Vances’ farmhouse in Kenwood, California, for several weeks. John Holbrook Vance was born in San Francisco on 28 August 1916 and died in Oakland on 26 May 2013. He wrote more than 60 books. In addition to work published under “Jack Vance”, he published 11 mystery stories as John Holbrook Vance and 3 as Ellery Queen as well as single titles using various different pen names, including Alan Wade, Peter Held, John van See and Jay Kavanse. Vance, educated at the University of California Berkeley, held a variety of jobs prior to serving in the Merchant Marine and becoming an established writer. Described by Carlo Rotella (in a 2009 profile for the New York Times Magazine) as “one of American literature’s most distinctive and undervalued voices”, Vance won numerous awards, including the Edgar Award (1960), the Hugo Award (1963, 1967), the Nebula Award (1966), the Jupiter Award (1975), the Achievement Award (1984), the Gilgam’s Award (1988), the World Fantasy Award (1990) and the Grand Master Award (1997). Brian Herbert. 2003. Dreamer of Dune: the biography of Frank Herbert. (New York: Tom Doherty Associates). Erik Jorgensen. 2014. “‘The Spice’ Flows From Santa Rosa“, Oak Leaf (SRJC’s Student Newspaper), 8 December 2014. Carlo Rotella. 2009. “The Genre Artist“, The New York Times Magazine, 15 July 2009. Tim Underwood and Chuck Miller (eds). 1980. Jack Vance. (Taplinger Publishing Company). Jack Vance. 2009. This Is Me, Jack Vance! Or, More Properly, This Is “I” (Subterranean Press). David B Williams. “Vance Museum – Miscellany – Biographical Sketch“.